In botany, a fruit is a plant structure that contains the plant's seeds. To a botanist, the word fruit is used only if it comes from the part of the flower which was an ovary. It is an extra layer round the seeds, which may or may not be fleshy. However, even in the field of botany, there is no general agreement on how fruits should be classified. Many do have extra layers from other parts of the flower. In general speech, and especially in cooking, fruits are a sweet product, and many botanical fruits are known as vegetables. This is how ordinary people use the words. On this page, we describe what botanists call a fruit. The fleshy part of a fruit is called the mesocarp. It is between the fruit's skin (exocarp) and the seeds. The white part of an apple, for example, is the "fleshy" part of the apple. Usually, when we eat a fruit, we eat the "fleshy" part. If the entire fruit is fleshy, except for maybe a thin skin, we call the fruit a berry. 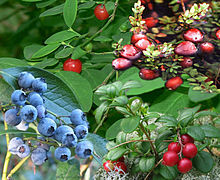 A berry might contain one seed or many. Grapes, avocados, and blueberries are berries. They all have a thin skin, but most of the fruit is fleshy. Strawberries, however, are actually not berries, because the seeds are on the outside: on a real berry, the seed or seeds must be inside. A pepo (pronounced pee' po) is a modified berry. Its skin is hard and thick and is usually called a "rind". Pumpkins and watermelons, for instance, are pepos. A hesperidium is another modified berry. It has a leathery skin that is not as hard as the skin of a pepo. All citrus fruit like oranges and lemon are hesperidiums. A pome (pohm) is a fruit that has a core surrounded by fleshy tissue that we can eat. The core is usually not eaten. Berries are different - the seeds are inside the fleshy part, not separated from it by a core. Apples and pears are pomes. Drupes are also called stone fruit. A drupe is a fleshy fruit with a hard stone around the seed. We usually call this "stone" the "pit" of the fruit. Peaches and olives are drupes. Actually, the almond fruit is a drupe, too, though we eat the seed that is inside the "pit" of the almond fruit. Since fruits are produced from fertilised ovaries in flowers, only flowering plants produce fruits. Fruits are an evolutionary 'invention' which help seeds get dispersed by animals. The botanical term includes many that are not "fruits" in the common sense of the term. such as the vegetables squash, pumpkins, cucumbers, tomato, peas, beans, corn, eggplant, and sweet pepper and some spices, such as allspice and chillies. 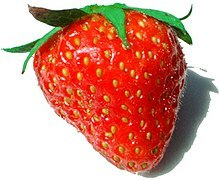 A Strawberry fruit: the 'seeds' are each derived from a pistil of the flower. An accessory fruit or false fruit (pseudocarp) is a fruit in which some of the flesh is derived not from the ovary but from some adjacent tissue. A fig is a type of accessory fruit called a syconium. Pomes, such as apples and pears, are also accessory fruits: the core is the true fruit. any produced by non-flowering plants, like juniper berries, which are the seed-containing female cones of conifers. fleshy fruit-like growths that develop from other plant tissues (like rhubarb). false berries: blackberry, strawberry, raspberry: they are aggregate fruits (see below). The yew berry is not a fruit at all because the yew is a conifer. Many fruits come from trees or bushes. For plants, fruits are a means of dispersal, usually by animals. When the fruit breaks apart, the seeds can go into the ground and begin to grow. Most fruits we eat contain a lot of water and natural sugars, and many are high in Vitamin C. They have a large amount of dietary fibre. Fruits are usually low in protein and fat content, but avocados and some nuts are exceptions to this. Not only humans, but our closest living relatives (primates) are keen fruit-eaters. So are many other groups of herbivorous mammals and many birds. Seedlessness is an important feature of some fruits of commerce. Commercial bananas, pineapple, and watermelons are examples of seedless fruits. Some citrus fruits, especially oranges, satsumas, mandarin oranges, and grapefruit are valued for their seedlessness. Seedless bananas and grapes are triploids, and seedlessness results from the abortion of the embryonic plant which is produced by fertilisation. The method requires normal pollination and fertilisation. ↑ Schlegel, Rolf 2003. Encyclopedic dictionary of plant breeding and related subjects. Haworth Press. ISBN 1-56022-950-0. ↑ Esau K. 1977. Anatomy of seed plants. Wiley New York. ↑ Note: the seed in a yew "berry" is very poisonous.